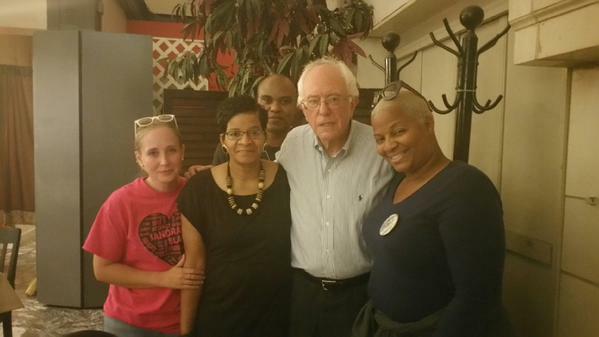 In an era when every moment is tweeted and politicized, Bernie Sanders elected not to capitalize on a meaningful meeting with the mother of Sandra Bland. The chance encounter reportedly took place at East Street Café, a Thai restaurant at Union Station in Washington, D.C., five days before the first Democratic presidential debate. The Rev. Hannah Adair Bonner, a pastor at St. John’s Church in downtown Houston, wrote in her blog about noticing the Vermont senator at another table while she was eating dinner with Geneva Reed-Veal, whose daughter became a face of the Black Lives Matter campaign following her death in police custody in July. The pastor said she approached Sanders and asked if he would like to meet Reed-Veal and told him their group had asked if he would take a picture with them. Bonner, who is a Black Lives Matter activist, said she was impressed by everyone’s sincerity during the serendipitous moment.